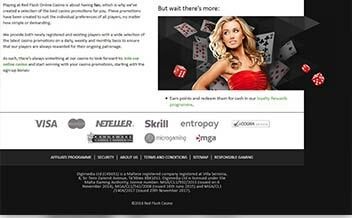 The Casino was started in 2008 by Digimedia Limited Casinos and has since continued to provide punters with an assortment of incredible games and amazing bonuses that seek to meet the needs of the vast online gambling market. The Casino is also a great promoter of responsible gambling. Having been in business for a decade, Red Flush Casino has certainly made a name for itself in the highly diverse online gambling market. The Casino has a rich selection of slots and games, solid customer support, is certified by eCOGRA and promotes responsible gambling. Additionally, the casino rewards new entrants as well as existing ones with bonuses and promotions throughout the month. Indifferent to other Casinos, Red Flush Casino offers its players amazing bonuses and promotions. New players are ushered in with a 100% match up to €200 for the first deposit. The second deposit is matched up with 50% up to €400 while the third deposit is matched up with a 25% up to €400. The welcome package amounts to €1,000 worth of gaming chips which is certainly not a bad way to start off at any online Casino. The player needs to wager the amount 40 times to enable withdrawal. 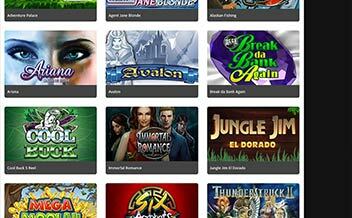 The Casino also rewards existing players with bonus offers and in-play promotions throughout the month. Red Flush Casino offers its players one of the richest selection of slot games. All the games in this section are developed by the renowned Microgaming and include the following Tomb Raider Secret of the Sword, Gemix, Hitman, Immortal Romance, among others. The Casino also has a rich selection of table games available for punters to enjoy. The games in this section are designed with the sole aim of enhancing the player’s experience. Some of the games available include Blackjack variants, Roulette variants, Baccarat variants, among others. 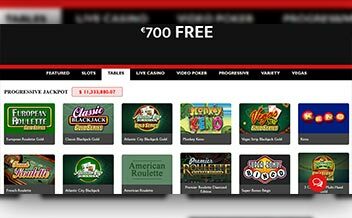 Red Flush Casino’s main developer, Microgaming boasts of providing some of the most lucrative video poker games. 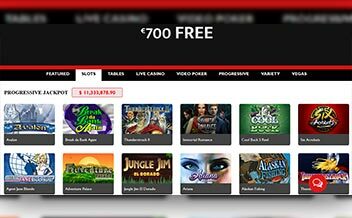 The games in this section are tailored to meet the needs of the gaming market and include the following Wild Deuces, PaiGow, Poker Wild, Aces and Faces, among others. The Casino is powered by the well-known Microgaming. This means that all the high-end online Casino games are available for players to enjoy. The Casino’s software has a user-friendly interface that allows punters to navigate through seamlessly. The Casino also uses Microgaming’s instant play and mobile soft wares. The United Kingdom, the United States, France, Denmark, China, Spain, Israel, Turkey, South Africa, Syria, Belgium, Curacao. Cuba, Hong Kong, Bulgaria, among others. Bank Wire Transfer, Visa, Skrill, NeoSurf, Euteller, Entropay, Visa Electron, Trustly, Diners Club International, Postepay, Maestro, POLi, iDEAL, among others. US dollars, Argentine pepos, Brazilian reals, Swiss francs, Mexican pesos, Namibian dollars, New Zealand dollars, Canadian dollars, Euros, Australian dollars, Norwegian Kroner, and Swedish Kronor. Red Flush Casino runs on download, instant play, and mobile versions. The Casino is also supported by major web browsers like Opera, Mozilla, and Chrome. Players can also access the Casino using both Android and IOS devices. It is proven fair by eCOGRA. Red Flush Casino is certainly a great platform for players looking for an assortment of slots and games, incredible bonuses and promotions, solid customer support, and client protection. Join the Casino today and start playing!